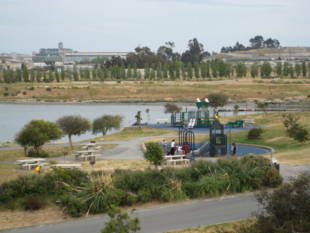 You'll find India Basin Shoreline Park equipped with public art, barbecue pits, picnic tables, and a fabulous playground. At the end of Fitch Street on your left is India Basin Open Space, a restored wetland and natural area maintained by the Recreation and Park Department where you'll find a walking trail and benches along the waterfront. 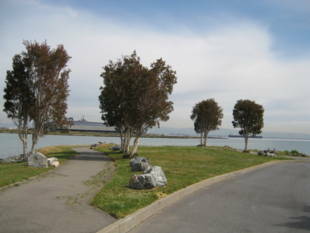 India Basin Shoreline Park is owned by the San Francisco Recreation and Parks Department. Closest routes are the 19-Polk and the 44-O'Shaughnessy. Exit at Evans Ave. and Middle Point Road. Continue on foot down Evans; it'll curve into Hunters Point Blvd. Turn left on Hawes Street and the park will be at the very end. The history of India Basin is a curious combination of industry and open space, business and pleasure. The name India Basin first appeared on a map in 1868, but theories as to its origin remain murky. The best guess is that India Basin is named for the ships from the India Rice Mill Company which docked there. A more creative explanation has it that it was so named because water from nearby springs would stay fresh until a ship reached India. By 1890, India Basin buzzed with activity from its extensive dry-docks and shipyards. Jack London's ship, the Snark, was built there, as were several Chinese junks used in the film 'Blood Alley,' starring John Wayne. India Basin boomed again during the war years, when it was used as a marina. Sailors crossed the rough and tumble bars of Third Street, and the area reeked of the stench from the nearby meat- packing houses of Butchertown. By the early 1970s, activity in the basin had declined dramatically. Butchertown was redeveloped into a large industrial park in an effort to revitalize the area, but shipping never recovered. 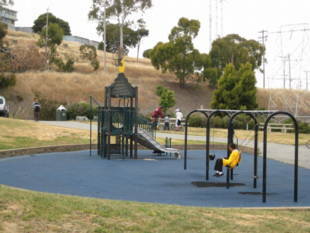 In August 1999, India Basin Shoreline Park was named a Renaissance Park by Mayor Willie Brown. 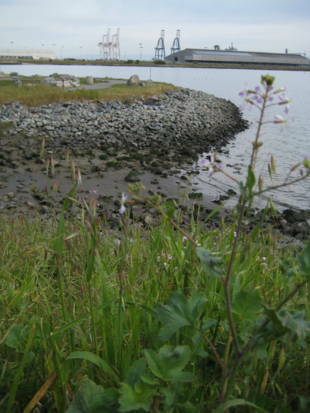 Supervised by the Trust for Public Land, Renaissance activities began with community outreach focusing on India Basin's location on the Bay Trail, better access to the park, and a survey of improvements needed when the park expands onto land already owned by the Recreation and Park Department. The outreach included quarterly newsletters sent to all nearby homes and businesses, presentations to community groups and residence organizations, visits to the park on heavy-use days, and a park cleanup day, with free pizza for the volunteers. Still in the planning stage is construction of a bridge that would span the adjacent PG&E power plant and link India Basin Park with Heron's Head Park, which is owned by the Port of San Francisco. 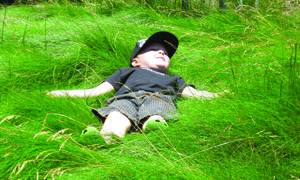 Work on the next phase of the park's improvement begins in September, 2000, with $179,300 in funding from the Open Space Committee, the Community Development Building Grant, and the San Francisco Conservation Corps, along with $378,000 from the Trust for Public Land. The project includes completing the Bay Trail through the India Basin Park, expanding green spaces, grading, fencing, some planting, and installing benches, a playground and a basketball court. 'We have been wanting these features since the neighborhood first initiated a park plan in 1978,' says Friends of India Basin's Jill Fox. The Friends are now seeking additional funding for a water fountain, educational signage and a children's art project. Completion is scheduled for June 2001. In November of this year, action begins on an undeveloped part of the park separated by private property. The project includes shoreline access, wetlands and upland plantings, signage, Bay Trail access and seating areas. The project is scheduled for completion in June, 2001.